Our integration lets you track LiveChat related data in Woopra as well as add some trigger actions that can show or hide the chat widget on your site when particular conditions are met. Woopra is an analytics platform that can help you understand your customer behavior. The tool tracks interactions across multiple devices and touch points, including email, live chat, and help desk. Woopra uses this data to build profiles for every user in real time. It lets you create customer segments that automatically update as user behavior changes. With Woopra, you can generate reports for your sales funnel or retention of your customers. There is also an option to create the custom report for a different purpose. To add to this, Woopra gives you the opportunity to create live dashboards based on your core KPIs. The solution integrates with many third-party apps so that you can use the data provided to automate triggered actions in your other app. For example, you can prioritize a help ticket or display a piece of content. The app also sends real-time notifications to you when customers perform important actions. All that it takes is a single visit to Woopra's marketplace and your good to go – integrate LiveChat with Woopra with one of the most effortless integrations available. With LiveChat for Woopra you can easily track the actions around your LiveChat integration. See how often your customers start a chat with you or receive messages from your agents – all of that under Woopra dashboard, right where you want them. Use the LiveChat Woopra integration to make live changes to your chat windows based on a user’s engagement, behavior, demographics, and other factors. Using LiveChat and Woopra together, you can measure the average amount of time between when a customer starts a chat conversation and when they finally make a purchase. 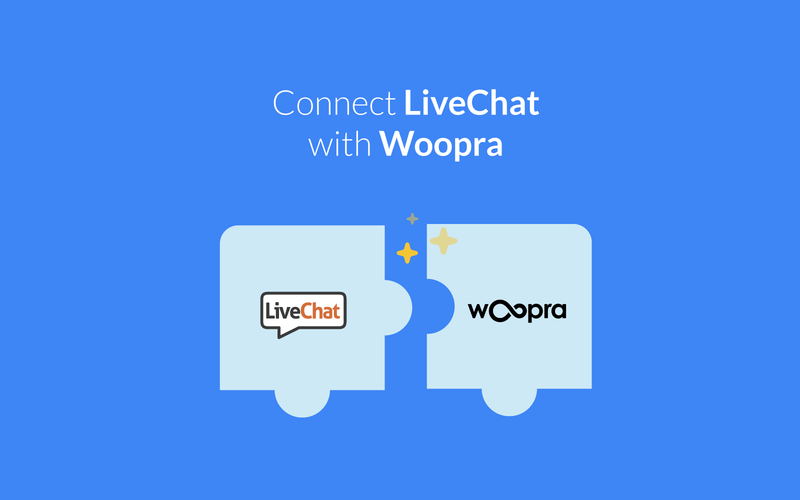 Start using LiveChat with Woopra now!